The CP-9 Pro+ is an amazing compressor pedal by Maxon. Let’s check out this stomp comp closely in the following review! Basically it’s a DBX unit in a pedal form. The construction is the usual Maxon style rugged metal casing, with three knobs, two LEDs and a rectangular footswitch, which is a bit stiff to operate, but it works well. The three knobs are: “THRESHOLD”, “RATIO” and “GAIN”, which is self-explanatory (check out this article if it isn’t yet). 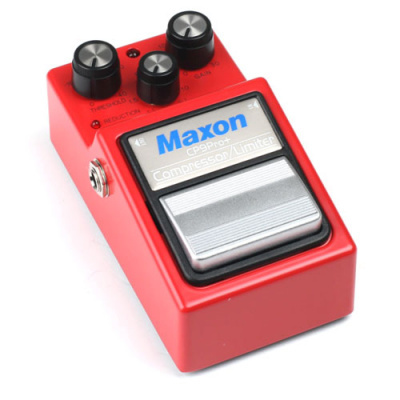 All three controls have tremendous range, you can even use the pedal as a clean booster, because there’s 30dB of gain available, according to Maxon. The main LED is for the bypass; the second, smaller LED indicates when the gain reduction happens. It’s not a VU meter by any means, but it’s a useful feature, especially compared to other compressor pedals with no metering at all. The pedal has got a nice, punchy action and a clean, sparkly tone with all the low and high frequencies intact, unlike for example a Dynacomp. You can set it up for a transparent tone ideal for (bass and guitar) tracking, or you can go wild and use it as a very obvious sustain effect, and anything between. Turning up the ratio turns this unit into a limiter. The Maxon compressor has virtually no noise on its own even at high ratios, besides the occasional noise you get from the guitar, pickups, cables, etc. The switch is true bypass. The pedal works with any regular center negative 9V DC adapter or a 9V battery, and the built in charge pump circuit doubles the internal voltage to 18V for higher headroom, to avoid unwanted distortion. ← Previous Previous post: Did you get the right pickups for your guitar?